Updated post from the old Pikitia Press blog to celebrate the 110th anniversary of New Zealand cartoonist Ian Dickson's birth. Ian Oscar Dickson was born in Dunedin, New Zealand, on 15 January 1905 and emigrated with his family to Melbourne, Australia, in 1913. Dickson, a self-taught artist, had work published in the Adelaide Register News Pictorial, the Rockhampton Morning Bulletin, the Brisbane Telegraph and illustrated tourist brochures for the Queensland government. Dickson eventually emigrated to England and found work with film companies and Razzle magazine. In the early thirties Dickson spent several months in Ceylon and after a period back in Australia he relocated there to work for the Times of Ceylon and Ceylon Observer. 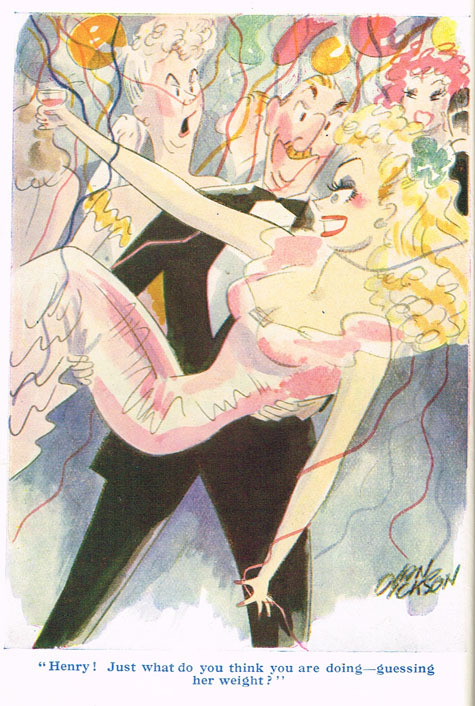 In 1935 Dickson returned to England where he produced work for Punch, London Opinion, Men Only and Blighty. Dickson was a prolific contributor to these men's digests with some issues featuring three or four pages of his work. During the War Dickson served with the Royal Air Force. In the fifties and sixties Dickson contributed three or four panel gag strips for Eagle, Girl and Swift Annuals from Hulton Press. Dickson's friend fellow cartoonist Australian John Jensen shared that at some point Dickson burned most of his original cartoon art. " He said they took up too much space. No value to anyone . . .There was no Cartoon Museum when he did the deed. I still haven't forgiven him.Dickson died 21st July 1987." Below: Selection of Ian Dickson's gag cartoons from Men Only circa 1940-1950's. Sources: http://illustrationartgallery.blogspot.com, Men Only 1946-1954, British Cartoonist's Album, Dictionary of British Cartoonists and Caricaturists 1730-1980 compiled by Mark Bryant and Simon Heneage, http://bearalley.blogspot.com.